Revising KORA: Amending the definition of “public records” to include emails sent to and from non-government accounts that relate to public business | Kautsch Law, L.L.C. In light of the controversy last year over the state budget director’s use of a private email account to discuss public business, the Kansas Legislature will likely attempt to revise the Kansas Open Records Act (KORA) this coming session. Because the budget director sent and received emails on the private account, they were not in the possession of a public agency and thus were not records subject to disclosure under KORA. Open-government advocates would like the Legislature to amend KORA so that the disclosure of public records, including officials’ emails, will not depend on whether they are “in the possession of any public agency.” K.S.A. 45-217(g)(1). 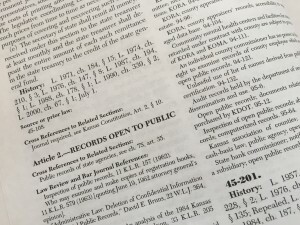 If the Legislature indeed takes steps to amend the definition of “public records” that has been on the books since the KORA’s inception in 1984, Kansas could take an approach like that in many other states. There, public access to public records depends, not on where they are, but rather on whether their content is “in connection with” public duties. See, e.g., 51 Oklahoma Statutes 24A.3.1(“‘Record’ means all documents…or other material regardless of physical form or characteristic, created by, received by, under the authority of, or coming into the custody, control or possession of public officials, public bodies, or their representatives in connection with the transaction of public business, the expenditure of public funds or the administering of public property.”); Texas Public Information Act 552.002 (“‘Public information’ means information that is written, produced, collected, assembled, or maintained under a law or ordinance or in connection with the transaction of official business.”); and Tennessee Code Annotated 10-7-503(a)(1). Thus, an email sent or received on a private account would be subject to disclosure if the term “public record” is defined as information that relates to public business and is created or possessed by a public agency. Such a definition would be consistent with Chapter 45 of the Kansas Statutes Annotated, known as Public Records, Documents and Information. As part of this chapter, in 1981, three years before KORA became law, the Legislature enacted the Public Records Preservation act, K.S.A. 45-401 et seq. The public policy statement that guided its enactment was that “state and local government records with enduring value should be stored in conditions which are not adverse to their permanent preservation and should be properly arranged so that appropriate public access to such records is possible.” K.S.A. 45-401. Most importantly, the Preservation Act provides that “‘[g]overnment records’ means all…documents…and other data, information or documentary material, regardless of physical form or characteristics, storage media or condition of use, made or received by an agency in pursuance of law or in connection with the transaction of official business or bearing upon the official activities and functions of any governmental agency.” K.S.A. 45-402(d)(emphasis added). One problem, though, is that the definition of “public records” in KORA focuses on information created or possessed by a public agency, as opposed to information that is in the hands of individuals who work for the agency. As controversy over officials’ use of private email accounts has shown, records that relate to an agency’s business may be created or possessed personally by one who works for the agency, rather than by the agency itself. Thus, KORA should be amended to provide that the employees of an agency have a duty to maintain public records the same as the agency. 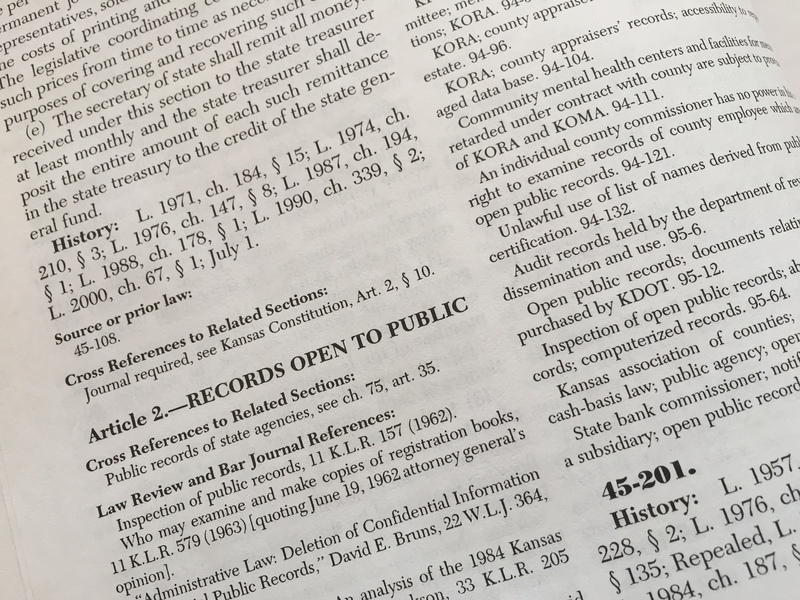 “Public records” means all information, regardless of physical form or characteristics, made or received by any public agency or officer or employee of such agency, in pursuance of law or in connection with the transaction of official business or bearing upon the official activities and functions of any public agency.